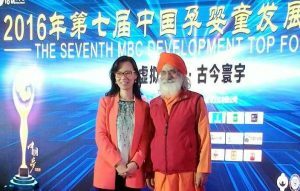 Dada Shambushivananda gave a keynote speech to 1500 heads of early childhood centers at the Seventh MBC Development Top Forum 2016 in Beijing, China, on October 22, 2016. The conference was organized by MBC, a Mother, Baby and Childcare organization. It was the seventh conference, and it is connected with Beijing University, one of the top universities in China. His speech was very much appreciated, with some expressing that tension had overwhelmed them since their commercial education careers had started. They want to see a change in direction of their work and welcome Neohumanist concepts. There is a new wave of awareness within the education community that the exploration of the deeper self cannot be separated from learning overall. In follow-up meetings for a smaller audience, Dada explained simple methods for bringing personal practices into the educational environment. This is part of a wider trend where more and more teachers are joining kids yoga teacher training programs and integrating these skills into the classroom. They use breathing, quiet time, yoga based movement and relaxation to help the children find greater balance and inner strength. Honourable Chief Guest, Members of the Organizing Committee of this Top Forum and beloved friends from all over China. It is my great honour and pleasure to be amidst all of you to discuss the future of our children and how industry can contribute further towards shaping it in more dynamic and benevolent ways. Thank you for your warm welcome and hospitality. Let me begin with a special greeting called Namaskar. The greeting gesture or namah-mudra , as it is called in Sanskrit is done by touching thumbs of both our palms together with the controlling points of pituitary and thymus glands symbolizing mind and heart respectively. It means that I extend warm greeting to you with all the divine charms of my mind and love and cordiality of my heart. Today, I wish to remind everyone here that we are more than just body and mind. We are the embodiment of something much greater and more precious, which every child is endowed with from his/her very birth. Our body is the greatest miracle in this universe. On top of it we carry a brain, which is even more of a miracle. It runs with a mere 25 watts of electricity and can store 1019 bytes of information, equivalent to all the digital information that exists on the planet earth at this time. Something that holds billions of cells together must be more charming, more powerful than anything that we know of. That is what sages have called “unit-consciousness” and various other names. Our children are not just ‘limited’ creatures who can be moulded into robotic learning machines. They are the repositories of this greatest invisible treasure, waiting to be manifested. What the cosmic mind is doing today will continue to be done by unit minds in slow and gradual steps. Industry has the sacred task to make itself available to enable these ‘divine manifestations’ to fully express their potentials. Learning systems need greater customization, just like our lap-tops, automobiles or mobile phones. Industry can contribute towards this effort. Yet, there will always be a need of wisdom-masters, Lao-Tzu’s and gurus. Information may be stored in computers or books and be easily accessible to anyone today. Knowledge may be extracted from the patterns of information contained in databases, but wisdom can only be drawn from within. You already know the difference between efficiency and effectiveness. Industry is quite good at doing things more ‘efficiently’ in this competitive world, achieving more with less i.e., doing the thing right. Effectiveness, on the other hand, is about doing the right thing or moving in the right direction to achieve deserving pre-set goals. It is here that we need foresight, imagination and intuition to grasp the evolving future. The effectiveness of the mission of this industry will depend upon how we view the future of our children and where we would like to see them in the future. It will dependent on how we understand the ‘future’, which is not always obvious to us. There are many forces shaping the future. Effectiveness is linked to our goals, our mission and our long-term vision. It is this long-term perspective to which I shall dwell this morning. Over a decade ago, I had the fortune to travel through the wilderness of Mongolia with a Mongolian father and his two children. At one point, we stopped to meditate and sat in motionless silence for over 90 minutes. The little child that you see on the screen here stayed in that motionless pose for all that period. I wonder today if this child would continue to retain that effortless natural serenity and innocence as s/he gets exposed to the wave of modernization that is sweeping the earth and leaving no one untouched. What type of society or development do we want? And why? This is a question that we all need to ponder in every age. What aspects of our past do we need to always hold on to? And what may have to be (or should be) sacrificed at the altar of the modern notion of “development” which tends to relegate everything of life into a tradable currency? The experience of two great civilizations- Chinese and Indian -amply demonstrates that there is great worth in the old cultures which should not be forgotten or set aside and which still blows like a fresh breeze and provides the fragrance of ‘oriental sublimity’. This must be the corner stone of our educational systems- something that provides the cultural fundaments of a long-lasting civilization. The Vedas and Upanishads in India were the products of such para-vidya’ – intuitional knowledge, linking us up to the spirit in us. This knowledge is not mere information but life-transforming wisdom. It is trans-disciplinary, transcendental as well and imbued with the tender sweetness of universal love. The contributions of great sages like Shiva and Krishna in India and Confucius and Lao-Tzu in China are a testimony to the importance accorded to higher values of life in these traditions. My mentor Shri P.R. Sarkar (1921-1990) propounded Neohumanism in 1982 to salvage the remnants of those ancient traditions. I shall be elaborating this approach tomorrow in greater detail during my stay here. A little reflection will remind us that every creature and every nation desires freedom, good health and happiness, material prosperity and abundance, progress and justice for all. Yet, these ideals remain elusive for us. My contention is that unless we develop and awaken our inner higher consciousness, we will always fall short of achieving these desired goals. The examples of France, Germany, Romania etc. also show that the educational philosophy of rearing children contributed to massive social changes decades later. Is it not true that the world we create around us is largely the result of our individual and collective thoughts, aspirations and proclivities? The cultivation of higher consciousness is the scope of para’-vidya’ – the knowledge that has practically disappeared from our educational systems. Vidya’ means knowledge, not just information and para’-vidya’ means knowledge of all that moves us. It poses a serious challenge and an opportunity. Challenge because it is not an easy task to touch the Transcendental and an opportunity because with it, we are richer with even less. Human longings are fundamentally fourfold: physical (ka’ma), psychic (artha), psycho-spiritual (dharma) and spiritual (moksa’). The pursuit of physical longings consumes the life of the bulk of the human population. It is important to recognize that desire for pleasure is inbuilt in our biology. There is nothing wrong with the pursuit of immediate pleasures but the only drawback is that it carries the seeds of addiction. If not properly restrained, the human mind can create havoc by unbridled desire for accumulation. It is no surprise that 1% of the population controls the bulk of the resources of this world in almost every country and disparities abound. The thirst for power is only an expression of a deep inherent longing to ensure lasting peace and happiness, which can only be quenched through psycho-spiritual pursuits. Hence the need to balance personal desires with the yoga of restraint. Here in lies the secret of integrating the psychology of self-enrichment with the endeavor of collective thrival. The long journey towards Ananda or Bliss is an inner journey, not only an outward journey. Both the inner and outer must be integrated and be in harmony. The inner journey means rising above all our propensities. It is no less of a challenge of life compared to reaching Mars on an outer space mission. Hence the need for a system of education that nurtures the exotic (spiritual) as well as the material. Spiritual here does not refer to religious education but relates to the discovery of the life-force that resides in each one of us and yet remains so distant from our normal consciousness. The future of humanity lies in how we rear our young and ourselves and with what ideals? A happy blending of para’-vidya’ (intuitional knowledge) and apara’-vidya’ (mundane knowledge) in educational praxis can ensure harmony between the inner and the outer spheres of life. 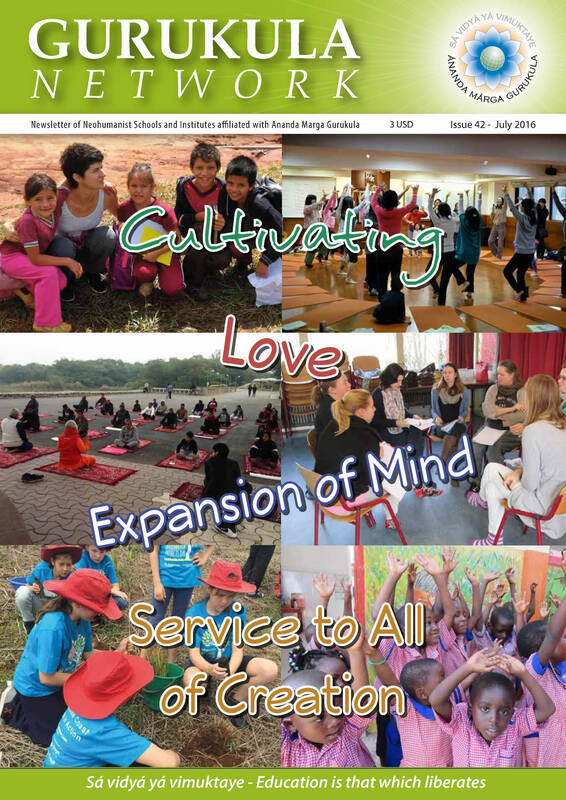 This approach to education which captures the spirit of “oriental sublimity” and “occidental dynamicity” offers a great promise to create a progressive society- a world where there is inner tranquility as well as a compassionate, just and sustainable world. 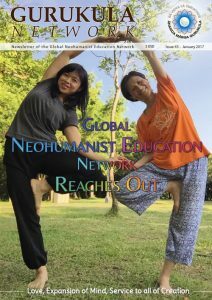 Yes, we need wisdom teachers today and that could be the role of neohumanist wisdom-based education- to help improve the wisdom- quotient of each human being. One of the foremost challenges for educators today is to empower good over evil, rationality over dogma, culture over brute force, truth over falsehood, selflessness over selfishness, peace over war, and spirit over matter.